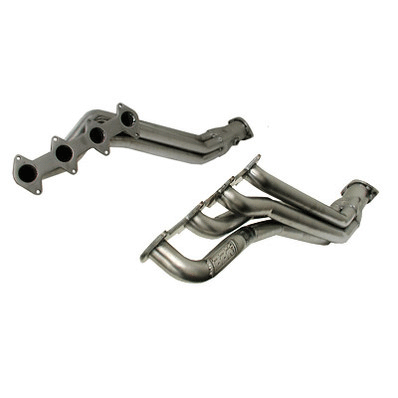 * Stainless Steel Finish These new BBK 2005-2009 Mustang GT full length stainless steel headers offer great power gains over the restrictive factory exhaust headers. Made out of high quality 304 stainless steel these full length headers are designed as a direct bolt on and when used with our short mid pipes they will bolt on to the existing factory or after market cat-back system. ALL BBK exhaust headers are pressure tested to ensure leak free performance. Each Stainless Steel full length exhaust header for the 2005-2009 Mustang GT has been designed and dyno tested at the BBK headquarters in Southern California to Maximize performance. Click Here for Instructions No one else can Stack up to the bold clean styling of our aftermarket Billet / Stainless Steel Dress Ups, Street / Strip / Racing Suspension and Performance Parts for your American Muscle Car! Fits these Vehicles: 2005 2006 2007 2008 2009 V8 GT 4.6L 3V Mustang Roush & Saleen Vehicles.